Your daughter will have a bedroom fit for a princess with this ornate, French styled poster bed in a luminous replicated paint finish. 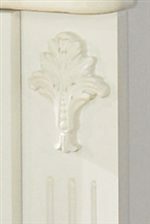 Traditional details throughout include acrylic appliques and rosettes on the arched headboard and shaped footboard trim. Both the headboard and footboard include button tufted upholstered panels in a pearl finish. The crowning touch for this princess bed are the faceted acrylic finials that top each bed post. This bed is available in twin and full sizes. The Exquisite Full Ornate Poster Bed with Tufted Headboard & Footboard by Signature Design by Ashley at Michael's Furniture Warehouse in the San Fernando & Los Angeles area. Product availability may vary. Contact us for the most current availability on this product. B188-89 Full Canopy/Poster Rails 1 55.28" 78.9" 12.95"
B188-72 Full Poster HDBD/FTBD 1 53.68" 2.99" 58.19"
The Exquisite collection is a great option if you are looking for Glam Traditional furniture in the San Fernando & Los Angeles area. Browse other items in the Exquisite collection from Michael's Furniture Warehouse in the San Fernando & Los Angeles area.